Check out the new face of cork floors. Zoom in on that image and ooooh and ahhhh. 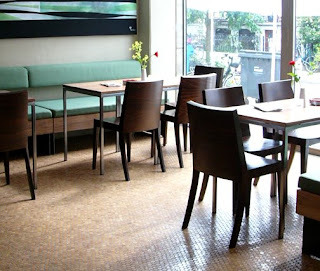 That's the newest incarnation of a cork floor and it's a cork mosaic floor. Here's how it works. Corks cut for use as wine stoppers are thinly sliced and glued to a square foot sheet of paper. Then they're installed with mastic and grouted in the same way one would install any other mosaic tile. Cork is resilient, water-resistant, sound deadening, flexible and renewable --all pluses in my book. Where this stuff really starts to shine though is that it can be stained to any color you'd l ike (that makes sense because after all, it's made from the same cellulose that any wood product is). 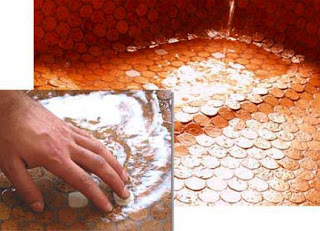 BUT, it can also be sealed and used in a wet area like a shower floor or a spa. This is too cool. I've never met a mosaic I didn't like and this stuff's great from every angle. These tiles are made by the Canadian firm, the Jelinek Cork Group. Jelinek has an extensive list of cork product offerings and I agree with them that cork doesn't get the attention in the US that it deserves. In addition to their well-done website, Jelinek operates and online store and outlet called The Corkhouse. At the Corkhouse you can browse through their flooring offerings, but where else but The Cork House are you going to find a cork purse or a cork hat?